abla de cifras facilitadas por la OMS y gráfico de la evolución. 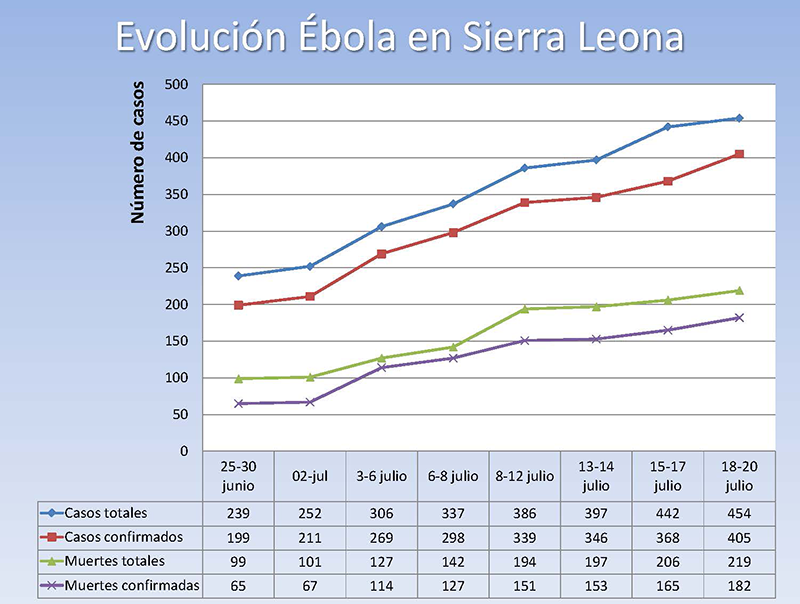 De nuevo actualizamos la gráfica sobre la evolución de la epidemia de Ébola en Sierra Leona y Liberia. También os reproducimos una crónica de Hassan Bruz con noticias de nuestro hospital en Mabesseneh. The Notion that most people who are participating in the fight against the dreadful Ebola Disease in the Country are operating with different motives contrary to the desires of the general populace, has been entertained by the Medical Director of the Catholic Mission in Sierra Leone- Bro. Michael Koroma. He is of the firm belief that some Stakeholders are either trying to enrich themselves at the expense of Ebola Victims, or have a pleasure in stigmatising defenceless individuals. Bro. Michael Koroma is particularly concerned with the Communication and Dissemination of pieces of Information regarding the diagnosis of suspected Ebola Patients. Joshua Sandy is the Head of Communications Unit at the St. John of God Catholic Hospital popularly known as the Mabessaneh Hospital in Lunsar. He made mention of 2 related cases the first of which had to do with a Patient that was brought to them from Mambolo in the Kambia District in early July. He said the Person was admitted as a result of his medical condition .He said the Surveillance Team later breezed in from Port Loko to take the Blood Samples of the Patient for onward tests at the Ebola Treatment Centre in Kenema. He said the Patient was subsequently ambulanced to Kenema after his case was said to be positive barely 24 hours later. The Head of Communications told the Sierra Leone News Agency in an interview that the ray of conflicting information started 3 Days later, when a relative of the Patient went to tell the Authorities at Mabessaneh Hospital that the case of his relative had been proved Negative. He said the Medical Director immediately contacted the Port Loko District Medical Officer to verify the information but that they were all baffled by the reply which said the Patient was a positive case of Ebola and that the Patient was still been admitted at the Centre in Kenema. He said the situation became painfully ridiculous when it was that very Evening the Patient was discharged with a Certificate. Joshua Sandy said the 2nd. Case had to do with some Staff Members of the Mabessaneh Hospital itself who reported to be unwell and subsequently admitted .He explained how the Management of the Hospital sent for the intervention of the Surveillance Team which went some 72 hours later and carried out Tests on those admitted. The Blood Samples of a Nurse and a Security Worker were sent to Kenema for proper screening. But merely 48 hours late, information was received from the office of the District Medical Officer that the Nurse was a Positive Case of Ebola while the Security Worker was said to be Negative. The following day-which was 16th.July, he said, a member of the Port Loko Surveillance Tem went to inform the Hospital Staff that the Security Officer who was initially declared Negative, had also turned out to be a Positive Case of Ebola. Interestingly enough, it was that very evening the Patient was confirmed Negative and subsequently discharged with a certificate. According to the Catholic Mission Medical Director, this has left them with a very serious doubt on subsequent results of Ebola Suspected Cases to be received from the Port Loko District Health Management Team. Bro. Michael Koroma was extremely perturbed by the conflicting versions between the Ebola treatment Centre in Kenema and the Port Loko District Health Management Team which tends to fussed up issues of such a dreadful Disease. He observed that a confirm case in any Environment should be followed by immediate actions with a view to minimise and control the spread of the disease. Bro. Michael Koroma said it is a protocol of the Ministry of Health and Sanitation for Blood Samples of a suspected case to be obtained within 24 hours after notification to the appropriate authorities. He said it was therefore inconceivable why the Surveillance Team from Port Loko could only show up after almost 72 hours after his report. He opined that such a slow response could exacerbate the spread of the Disease. The Mabessaneh Mission Medical Director said Government should establish an effective and efficient channel of Communication in order to avoid a recurrence of these kinds of confused developments. He said those in charge of Communication should remain mindful of the ethics of Communication because any wrong piece of information has the potential to traumatise not only the Suspect but the entire family and associates of that individual. He said because the current clumsy pattern of communication has the capability to dampen the cordial and complementing link between his Mission, it would be proper for Government to levy penalties against defaulters. Meanwhile, the Management of London Mining Company Limited has donated a Consignment of Ebola Preventives to the St John of God Hospital of Lunsar. The Consignment which included None Contact Forehead InfraRed Thermometers, Surgical Face Masks, Aprons, Gloves, Boots, Goggles and other Personal Preventive Equipments, were officially presented to the Hospital by the Community Relations Manager for London Mining Company- N’balu Sesay. This was in addition to some previous assistance the Company has rendered to the Hospital including the recent Training Organised for Nurses and other Medical Staff of the Hospital. In his remarks, Bro. Michael Koroma expressed profound thanks and appreciation to both the Local and Abroad Management of London Mining for what he referred to as a timely assistance in the fight against Ebola. He said the package was in line with the Strategies and Policies of the Health Ministry, noting that it will go a long way in the Prevention and Control of this dreadful disease. 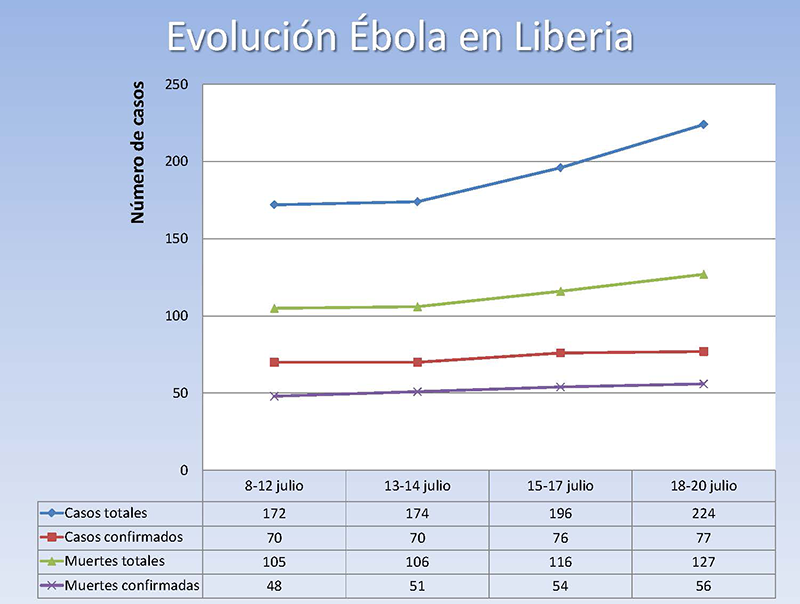 Esta entrada fue publicada en Acontecimientos, Hospital SJG Mabesseneh, Notícias / Actualidad, Temas de salud y etiquetada ébola, cifras, epidemia, EVD, Liberia, noticias, Saint John of God Catholic Hospital Mabesseneh, salud por comunicaciohsjdbcn. Guarda enlace permanente.